There will come a day in the near future when there will be no more gamers. Not because they'll have killed each other in some Grand Theft Auto-induced mass rampage, but rather because the term "gamer" will be irrelevant. Much like how we do not call people who view TV shows "watchers," or those that enjoy music as "listeners," playing games will become similarly as pervasive and commonplace as to render the "gamer" distinction archaic. At DICE in Las Vegas, game design guru - and former Disney Imagineer - Jesse Schell blew the socks off the assembled games industry veterans with his preview of the future of gaming and engagement. Schell posited that, in short, we'll be playing games on the back of our cereal box as we eat breakfast each morning and scoring points each time we high-five our buddy. It was a rare and cogent attempt to describe a future where everyone is a gamer - and everything is a game. But never mind the future, current examples and basic statistics are clearly pointing us in this direction. From the revelation that nearly 70 percent of US households play computer and videogames, to the estimated $50 billion+ in global retail game sales, or even the 11.5 million worldwide subscribers to World of Warcraft, or that Apple's App Store boasts over 20,000 games for download, or how social network game developer PlayFish's user database grew to 50 million unique players in under 20 months - games are all around us. That's just looking at what one might call the mainstream, or the traditional notion of the games business. Most games industry outsiders view the business as fitting into a tidy box that includes, well, the Xbox along with the other consoles, perhaps portable devices like the Nintendo DS, and maybe acknowledge that there's some game stuff going on via the Internet. 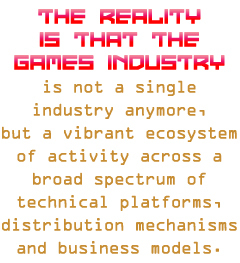 The reality is that the games industry is not a single industry anymore, but a vibrant ecosystem of activity across a broad spectrum of technical platforms, distribution mechanisms and business models. In one corner of this ecosystem are more serious games, where game tech and design aesthetics are used in such applications as corporate training or health care. Another pocket of the ecosystem boasts passion-driven indie pursuits created in Flash and uploaded to the web for all to enjoy freely. Yet another pocket is the use of mixed-mode games, or "alternate reality games," for highly engaging and often covert marketing campaigns. Not to mention the online virtual worlds kids can log into after getting a new stuffed animal from grandma. Games were used in the run-ups to the past two US presidential elections, and, similarly, a whole genre of games called persuasive games are politically driven explorations of current affairs. While some of these activities represent better business opportunities than others, a key point is that game technologies and techniques are being commoditized (in terms of one's ability to create and distribute a game) and simultaneously being elevated to a viable form of artistic expression, able to address the full range of the human condition.